The first Thanksgiving we celebrated in California involved being away from family for the first time. It was 1996 and we had been married two years. For the previous holidays we were able to make the trip home, spend time with our families, and enjoy mom’s cooking. That fall in the Golden State, I decided that this Thanksgiving I would make the turkey, dressing, and all the fixings and we would have our friends over. I look at that meal now and just laugh. I was not a great cook then, but I did make one recipe that has become a staple for us. I was never a huge fan of the pureed sweet potatoes with the marshmallows on top that is a standard in our part of the country, so I went in another direction and found a sweet potato recipe that was very different. So if you are looking for a different, geeky, unusual way to served the orange tuber, look no further. Give these a try and you won’t be disappointed. Preheat the oven to 375º F. Brush 1 tablespoon of the oil over the bottom and sides of a 13×9-inch glass baking dish. Set aside. Heat the remaining 3 tablespoons oil in a large skillet over medium-high heat. Add the onions and sauté until quite soft, about 15 min.. Remove from heat. 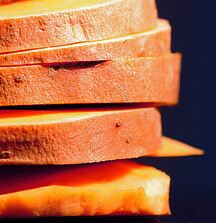 To make the gratin, alternate layers of the onion, sweet potatoes and cheese. Sprinkle each layer with some salt, pepper and nutmeg. Be sure the top layer will be cheese, but set the final layer of cheese aside, to add later. Pour the cider over the whole gratin. Bake covered until the potatoes feel nearly tender when pierced with the tip of a sharp knife, ½ to 1 hour. Then, uncover and bake for another ½ hour. During the final 15 min. of baking, add the last layer of cheese and bake until cheese is melted. Serve hot. I use frozen onions to save time. You can use dehydrated onion too if you rehydrate them but watch closely as they tend to burn quickly in the olive oil. Use your food processor to slice the sweet potatoes and grate the cheese. Put the cheese into your freezer for about 10-15 minutes to help with the grating. Otherwise it is too soft. The smoked cheddar cheese is usually with the specialty cheese in the deli area (at least in my grocery store). ← Losing or Re-adjusting My Vocabulary?